This is Kliuchevskoi, an active volcano on the Kamchatka Peninsula, photographed from an extremely oblique angle by astronauts onboard the International Space Station. When viewing conditions are favorable, astronauts on the International Space Station (ISS) can take unusual and striking images of the Earth. 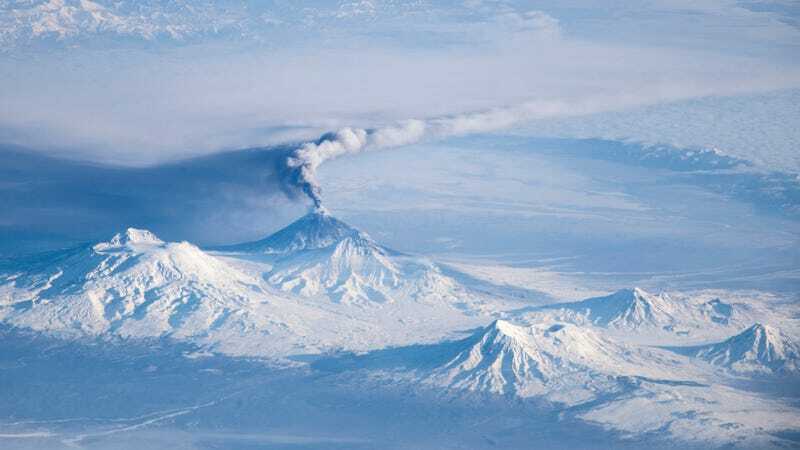 This photograph provides a view of an eruption plume emanating from Kliuchevskoi, one of the many active volcanoes on the Kamchatka Peninsula. The nadir views—looking straight down—acquired by most satellites tend to flatten the landscape and reduce our sense of three-dimensional topography. In contrast, this photo was taken from the ISS with an oblique viewing angle that gives a strong sense of three dimensions, which are also accentuated by the shadows cast by the volcanic peaks.